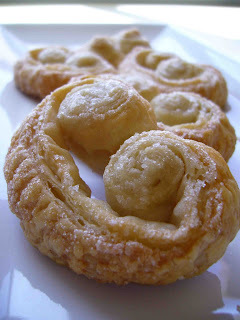 Making a palmier at home is a good reminder for me of how simple it can be to make something elegant and delicious. It's that principle that turned me on to cooking in the first place. Creating a meal from scratch always seemed like a bit of a far off, somewhat unattainable process. That is until I actually started to do it for myself. My brother bought me my first cookbook, The Joy of Cooking, at the end of my college career and as I started exploring the pages and trying some of the recipes, I realized that all it really involved was combining certain ingredients, in a certain order or way. From there, the whole culinary world opened up for me. Making palmiers reminds me of that feeling. Just take two simple ingredients, puff pastry and sugar, and combine them to make something delicious. Something that when purchased in a store, always seemed like it must be more complex than it really is to make. Roll out puff pastry sheet to elongate. Sprinkle 1/4 cup sugar over sheet and roll sheet onto itself from two sides until the two rolls meet in the middle. Cover outside of the rolls with remaining 1/4 cup sugar and slice roll into 1/2 inch slices. Lay slices down on a baking sheet covered with a silpat or nonstick spray. Bake for 22 - 24 minutes until just starting to turn golden and let cool slightly before enjoying. Cute picture - who knew they were so easy to make!